“Defects can inadvertently be produced in composite materials either during the manufacturing process or during the normal service life of the component. 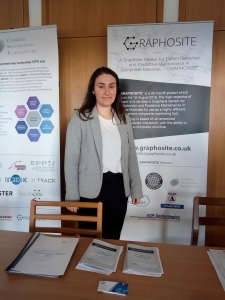 This project therefore seeks to develop GRAPHOSITE (A Graphene Sensor for Defect Detection and Predictive Maintenance in Composite Materials for use as a highly efficient, more convenient composite monitoring tool). Our technology will be based on an enhanced graphene-substrate interaction, with the ability to embed within a composite structure. The successful exploitation of the technology will result in cumulative revenue of £103m after 6 years in the market. The “GRAPHOSITE” is a 30-month project which started on the 1st August 2018. 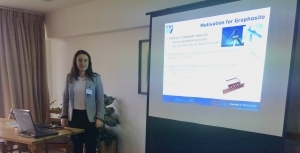 The main objective of the project is to develop a Graphene Sensor for Defect Detection and Predictive Maintenance in Composite Materials for use as a highly efficient, more convenient composite monitoring tool. ADVISE-DETA is a recently formed SME that specialises in implementing advanced sensors to a wide range of material transformation processes, including polymer processing, composite materials manufacturing, mixing of chemicals and repair of structures. To this end, the company owns the IP (through transfer from ADVISE, Greece) of the dielectric monitoring system, which includes dielectric sensors, electronic measurement hardware and intelligent process monitoring software. The system has been installed in several industrial sites of advanced composites manufacturing. The business goal is to market the existing technology and establish new applications in modern manufacturing processes. The company’s laboratory includes process characterisation methods (viscometer, optical microscope), dielectric measurement systems (frequency analyser, dielectric cure monitoring systems, material state based control prototype, temperature controlled sample holders) and software programming and modelling tools (LabView, Matlab). Brunel Composite Centre (BCC) is part of the Institute of Materials and Manufacturing of Brunel University. BCC operates with the aim of developing a financially sustainable research facility, drawing on Brunel University’s existing strengths, to complement and underpin the applied research and development activities of TWI. DZP Technologies is a leading developer of specialty materials, formulations, and technologies for emerging industries. We work closely with our customers to create innovative materials for a range of markets, from consumer electronics and wearables, to 3D-printing and renewable energy. Founded in 2008, we work with forward-thinking businesses and enterprises to fast-track scientific discoveries and create advanced technologies for a wide range of markets. We are happy to take on the toughest technical challenges, using our expertise to help our customers develop innovative, sustainable products which offer a true differentiator in competitive markets. Cambridge Nanomaterials Technology (CNT) Ltd is a nanomaterials innovation, management and technology consulting company based in Cambridge, England. The CNT Ltd helps companies, academic and government institutions to develop nanomaterials related R&D and IPR strategy, partnership, products, technologies and market. The CNT Ltd is a leader of a private Nano-Carbon Enhanced Materials (NCEM) consortium with members coming from leading multinational companies and research institutions that have been running for more than 6 years. The CNT Ltd is involved in collaborative R&D project management, such as EU Horizon 2020 projects: EPPN project (www.eppn.eu); n-TRACK (www.n-track.eu); Oyster (www.oyster-project.eu); M3DLoC (www.m3dloc.eu); Genesis (www.genesis-h2020.eu); as well as another Innovate UK project: UltraMAT (www.ultramat.co.uk). The role of CNT in the projects has been from helping with the exploitation and dissemination management of the projects. HAYDALE Composite Solutions Ltd is an independent research and development company based in Loughborough, UK specialising in the development of advanced composites and nanomaterial enhanced composites and their applications. The company employs highly qualified engineers with mechanical engineering and material science backgrounds. The company has extensive knowledge of both thermosetting and thermoplastic based composites, manufacturing processes, structural design and applications across a broad range of industries. The company utilise the latest in computer aided design systems and have access to its own prototyping workshops. We are a global technology solutions company passionate about creating the next generation of advanced materials. We bring together cutting-edge technology with engineering know-how to enhance the performance of products and materials thus delivering business value for our customers. Innovation underpins everything we do. TWI is one of the world’s foremost independent research and technology organisations, with expertise in materials joining and engineering processes as applied in industry. TWI specialises in innovation, knowledge transfer and in solving problems across all aspects of manufacturing, fabrication and whole-life integrity management. Established in Cambridge, UK in 1946, the organisation has gained a first-class reputation for service through its teams of respected consultants, scientists, engineers and support staff. With around 800 employees, it works with over 1800 Industrial Member companies in over 70 countries. TWI currently operates from 54,000 square metres (581,000 square feet) of manufacturing, testing and training space; five UK and 13 overseas facilities serve both its Industrial Membership and its training and examination needs. A successful international Training and Examinations programme sees around 25,000 students trained each year in welding and inspection technologies. In 2015, TWI opened three new laboratories at its Cambridge headquarters, including state-of-the art facilities for the National Structural Integrity Research Centre, a dedicated postgraduate centre for industry-led engineering research. Alongside is its management of an Innovation Network where a growing number of Innovation Centres are positioned to share research and technology capabilities, undertake joint research programmes and develop the next generation of technologies and engineers in the selected research disciplines. TWI also houses a professional institution, The Welding Institute, with a separate membership of 6000 individuals. GRAPHOSITE Project in the news!!! The JEC Group magazine has also published another article about the project in the April edition. You can read the article here. The GRAPHOSITE Partner, TWI, has been behind this effort. http://www.graphosite.co.uk/wp-content/uploads/2018/10/G-icon2.png 0 0 Monica_adm http://www.graphosite.co.uk/wp-content/uploads/2018/10/G-icon2.png Monica_adm2019-04-03 15:55:342019-04-03 15:57:37GRAPHOSITE Project in the news!!! 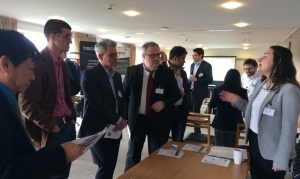 GRAPHOSITE was invited to participate in the UltraMAT Open Day 2019 Workshop. The UltraMAT is also an Innovate UK funded project, where Cambridge Nanomaterials Technology Ltd. (CNT) is one of its partners in charge of Exploitation and Dissemination. The event took place in Hughes Hall College in Cambridge on the 7 March. GRAPHOSITE had an exhibition desk and Sofia Sampethai from TWI was also invited to talk about the project. Other GRAPHOSITE Partners (Haydale and DTZ Technologies Ltd) presented their organisations and talked about their general role in the project. This was a great opportunity for the GRAPHOSITE project to get the interest of other organisations in their activities. The GRAPHOSITE Consortium team had the Q2 Meeting on the 19th February 2019 at the TWI Offices in Cambridge. Part of the discussions were the project participation in the Open Day of the UltraMAT Project (www.ultramat.co.uk) on the 7th March. GRAPHOSITE has been invited to give a talk and have a small exhibition at this event. Innovate UK is the UK’s innovation agency. Innovate UK is an executive non-departmental public body, sponsored by the Department for Business, Energy & Industrial Strategy.